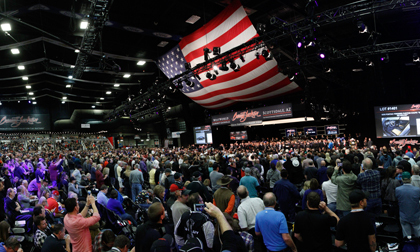 SCOTTSDALE, Ariz. – Dec. 27, 2017 – Barrett-Jackson continues to expand its premier auction in Scottsdale and will once again feature more than 1,600 vehicles, along with activities and hundreds of exhibitors inside over one million square feet of covered space at WestWorld of Scottsdale for its 47th Annual Auction, January 13-21, 2018. The event, featuring 37 hours of live television coverage throughout the week in the U.S. – on Discovery and Velocity – and internationally, kicks off Saturday, January 13, with QuikTrip Family Value Day, where kids 12 and under receive free admission. Preview weekend, January 13-14, will also feature Dodge Thrill Rides, multiple Monster Energy Motorcycle Stunt Shows, hundreds of exhibitors and the highly anticipated invite-only Opening Night Gala. Gates open at 8:00 a.m. each day, with the Thrill Rides beginning at 9:00 a.m. The collector car and automobilia auctions begin Monday, January 15, and run through Sunday, January 21. Gates open at 8:00 a.m. during auction week, along with exhibitors and food courts. The Ford Ride ’N Drives, Chevrolet Hot Laps and Dodge Thrill Rides – a staple of the Barrett-Jackson Auction experience – are open from 9:00 a.m. to 6:00 p.m. Other highlights include the complimentary Behind the Hobby Collector Car Symposiums, the Barrett-Jackson Restoration Garage, the Barrett-Jackson Live Stage and the new STEAM City – a fun and educational experience including interactive demonstrations and hands-on activities to engage kids and families in areas of STEAM: Science, Technology, Engineering, the Arts and Math. A complete list of events, activities and times can be found at Barrett-Jackson.com. Live television coverage begins Tuesday, January 16, and runs through Sunday, January 21, with a total of 37 hours of live coverage. Discovery Channel will provide live prime-time coverage on Wednesday, January 17, from 4:00 to 9:00 pm. The auction will also be available internationally across the Discovery Communications networks, including Velocity Canada and Discovery Turbo U.K.
*Additional networks may be added, visit Barrett-Jackson.com for the most up-to-date information.